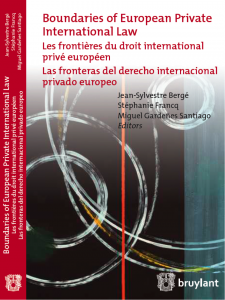 The new book Boundaries of European Private International Law, edited by Jean-Sylvestre Bergé (Université Jean Moulin Lyon 3), Stéphanie Francq (Université catholique de Louvain) and Miguel Gardeñes Santiago (Universitat Autònoma de Barcelona), is the result of two European workshops (funded by the Jean Monnet Programme) that brought together renowned specialists and young researchers. This collective work tackles issues relating to the boundaries of EUPIL from diverse perspectives and offers a great variety of contributions in English, French and Spanish. Eduardo Álvarez Armas, Céline Camara, Maria Asunción Cebrián Salvat, Clara Isabel Cordero Álvarez, Michaël Da Lozzo, Libor Havelka, Jayne Holliday, Nicolas Kyriakides, Nicolo Nisi, Cécile Pellegrini, Maria Teresa Solis Santos, Josep Suquet Capdevila, Verona Tió. Lydia Beil, Farouk Bellil , Blandine De Clavière, Eléonore De Duve, Alexandre Defossez, María Aránzazu Gandía Sellens, Jacqueline Gray, Ulgjesa Grusic, , Marion Ho-Dac, Laura Liubertaite, Céline Moille, , Guillermo Palao Moreno, Amélie Panet, Bianca Pascale, Pablo Quinzá Redondo, Katharina Raffelsieper, Maria Teresa Solis Santos, Ioannis Somarakis, Josep Suquet Capdevila, Verona Tió, Fieke Van Overbeeke, Huang Zhang. 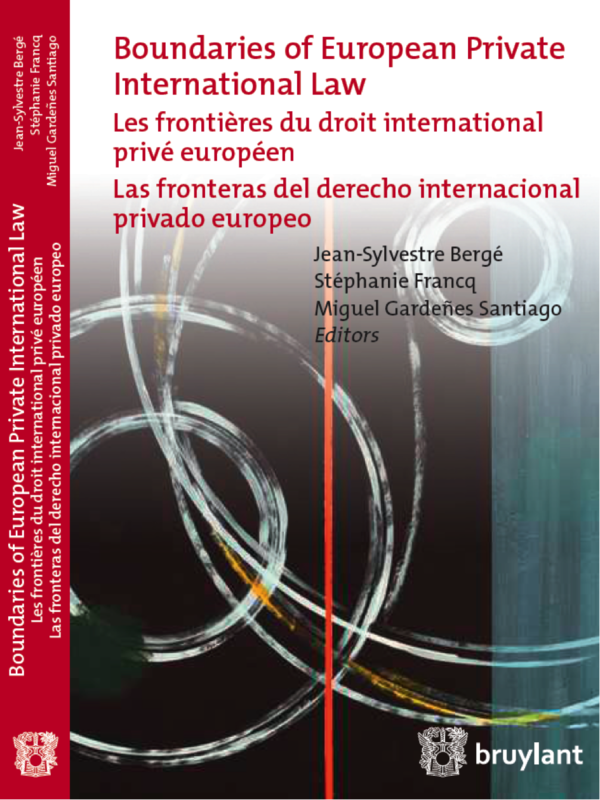 Boundaries of European Private International law, Bruylant, 2015 – 698 pages. ISBN 9782802746973. Publication date: 1 April 2015. Many thanks to Céline Camara for the hint.